The winning team was Osmanabad. The officials present were Mr.Sharad Gavhar, Mr.Satish Jadhav, Mr.Parmeshwar More, Mr.Anil Shinde, Mr.Vishal Kachare, Mr.Tukaram Bhosale,Mr.Vishal Nalawade.Mr.Yogesh Jamale, Mr.Nitin Pawar,Mr.Shrirang Raut,Mr.Dhanjaya Gavhar. District Sports Department Aurangabad and Squash Rackets Assocation of Aurangabad organised Inter School Divisional Squash Tournament at Nath Valley English High School at Aurangabad on 2nd December 2013. Boys and Girls U-17 category was played. Opening ceremony was done by District Sports Officer Gautam Salve, Kalyan Gadekar (Secretary, Aurangabad Dist Association) and Sunil Dawkar (Development Officer, Sports). The districts particpated were Aurangabad, Parbhani and Hingoli. The Winners were Aurangabad District. The players were Boys (U-17) Amrit Dadgupta, Varun Sankle, Chasunmeen Bindra, Salil Dobal, Girls (U-17) Mehek Wadhwani, Prajecta Patil, Mehek Arora, Tanisha Rajpal. District Sports Department Thane and Squash Rackets Assocation of Thane organised Inter School Divisional Squash Tournament at Dadoji Konddeo Stadium, Thane on 8th December 2013. The Boys and Girls U-17 category were being played. The districts who were invited to participate were Thane, Mumbai City and Mumbai Suburban. The Winners were Thane Distict and the winners were Boys U-17 : Atharva Malpure, Mandar Athavale, Darshan Thakur, Anurag Patil and Girls were Diksha Sykhede, Asmita Saigan, Rakishta Tambe and Anisha Anilkumar. Officials present were Ramesh Poshampelu (District Sports Officer, Thane), Sanjay Kale (Squash Secretary, Thane) and Sports Teachers Dipak Malpure, Ankur Aher and Chaitanya Malpure. A meeting to hear the problem faced by the representatives of 25 districts associated with SRAM was conducted by Mr Harvardhan Patil (Chief Patron of ISP and Minister Government of Maharashtra) with the Maharashtra Minister of Sports Mr Padmakar Valvi at Sahayadri Guest House, Malabar Hill, Mumbai on 3rd August 2013. The meeting was attended by more than 35 officials of various districts in Maharashtra. Mr Padmakar Valvi promised to raise the standard of squash and he has already instructed the District Collectors to build one squash court in all District Sports Stadium for which the Sports Ministry gives Rs 2 crores as grant. · Squash in School games to be introduced by December 2013. · Academy to be built in Balewadi, Pune. · 2 squash courts built in Dharavi Sports Complex to be handed over to SRAM by March 2014. Fun Cricket in the court...Squash Style. This is like playing normal cricket in the squash court…..having a squash tournament with foam ball, best of 1 game & we'll use a squash racket instead of the regular bat…….and bat facing the front wall with the door being the stumps. 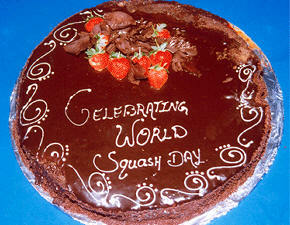 Cutting the World Squash Day cake. Exciting games and gifts – all participants received a gift for attending this celebration. Also the tournament GOLDS GYM - ISP SQUASH MASTERS 2008, Mens Top 8 by Invitation, Doubles Top-8 by Invitation & Open Squash Event for Celebrities was conducted.